Yes, you probably knew I didn’t post earlier because it isn’t good news this week. I’m slightly confused why it’s up, but I was expecting a maintain after the larger loss last week and some Mother’s Day treats this past weekend. Apparently I didn’t recover as well as I had hoped. *sigh* I was sorely vexed about it this morning and as I had plenty of stuff to do today I figured posting could wait until I was in a better mood. As you can see below I decided two months ago tomorrow to do the 10K instead of another 5K. This is my longest race to date. I was very nervous at the idea, even running it by some friends after my husband suggested I push myself a bit. They all agreed I should go for it. Then I searched online for a training plan that went well with my running experience so far (very much “new runner”). 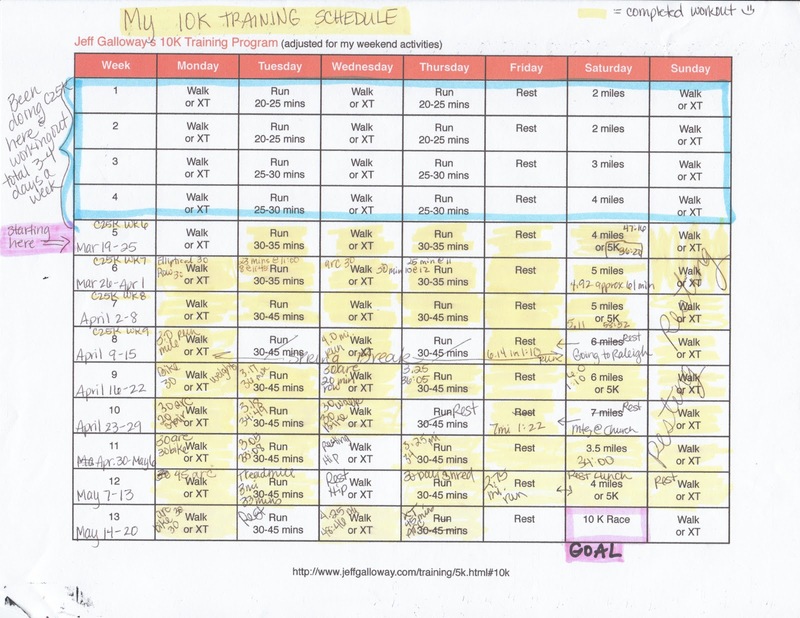 I chose Jeff Galloway’s 10K Training Program and it has served me well. I copied the above chart after the one on his website, switching my rest day to Fridays and Sundays and doing the long runs on Saturdays. Next week I’ll write a bit about some things I learned during this training period. In the meantime, I’m heading out to pick up the race packets and then going to dinner with my son before a practice at church. My husband has been out of town all week and returns this evening. We’re looking forward to some relaxing later and getting to bed early so we can rise and shine early for our 7:25 am race tomorrow. I’ll definitely be back to tell you about it!